Stock index futures were on a path to flat open as investors longed for news on Deutsche Bank's agreement with the U.S. Department of Justice and the speeches from Federal Reserve's decision makers. There are meetings that are going on to discuss the terms of settling this fine and speculations were rife in the course of the weekend that the bank desired the penalty to be lowered. Trading on Monday saw the Dow falling 104.40 points amidst lows before it ended up slipping by 55 points. Additionally, the S&P 500 went down by 0.3 per cent, while real estate plunging by 1.8 per cent to become the lead decliner. While the U.S. rate hiking schedule kicked off on Tuesday, most investors eye the employment data for September scheduled to be released on Friday. Two Federal Reserve speakers are scheduled to speak on the possibility of rate hikes in the course of the week. Richmond Fed President Jeffrey Lacker insisted that there was need to increase interest rates and in order to ensure that inflation was kept under control. In Europe, shares of Deutsche Bank had recorded a higher value on their first day of trading after a long weekend. The bank went through challenging days last week where the Department of Justice leveled a penalty of $14 billion due to the role the bank played in a festival of toxic mortgage securities in Wall Street in the period that leads to the 2008 financial crisis. Given the many other troubles that Deutsche have experienced – manipulating the financial benchmark, the general confusion that surrounds its mission, and issues of trades that seemed to have violated the sanctions placed in Russia – makes the American move to charge the bank a huge fine visiting at the inopportune moment. The dangers facing Deutsche Bank sent the stock markets across the globe on a wild ride. However, the biggest worry seems to emanate from the vast array of unknowns and not its finances. Furthermore, the bank seems not to bother whether Europe will be able to muster the will to embark on a rescue mission. All these seem to heighten the fact that Deutsche Bank – whose shares have declined to more than half their value this year – requires some new investments that are secure, in case it wishes to avoid any impending crisis. The biggest fear lurks when Deutsche will disintegrate to a point that it will threaten the globe with a financial shock. However, the main question will lie on whether the buffers and new rules that were instigated after the last crisis can prevent the severity from spreading. The chaos ranging from the debt crisis to the bitterness over the rising number of refugees, European governments have shown something less than an example of a united government action. The EU seems to have embraced populist anger and encouraged constraining solutions. With Germany not allowing bailouts for banks from other countries, the mission to rescue Deutsche is politically radioactive. If the worst case scenario is to happen – the bank may possibly collapse, forcing the bank to collect money from the global market. Various institutions that carry out trades with Deutsche may be inclined to get their cash back. Given the amounts of cash witnessed in the bank's balance sheet that can extend to up to 1.8 trillion euros, then the effect will have to be distributed to every financial crevice in the world. Despite rumours in pundit quarters indicating this type of scenario may be re-emerging, provokes similarity to be traced back to the disastrous bankruptcy experienced by one of the American banking big boy, the Lehman Brothers, about eight years ago, but most economists disregard the talk as overambitious and overblown. The shares of Lehman had seen a tremendous decrease in value at the CMC Markets. Deutsche Bank's cash reserves sums up to about €240 billion. It has further sold bonds that can end up to be equity whenever it deems necessary. The fine of $14 billion proposed by the Justice Department unveils a possibility for a negotiation that could amount to a fraction of the amount. It is such a way of interpretation that left the stock surging on September 30th. Cabela's (CAB) is being purchased by Bass Pro Shops in a cash deal for $5.5 billion or $65.50 a share for Cabela's shareholders. So CAB shareholders will receive $65.50 a share. Cabela's stock has been around $62 to $63 all morning. There has been as much as a 4% spread to made. I bought some CAB at 62.90 this morning. There is still over a 3% spread at the moment. If there is a mini market crash the spread could even widen. So it's worth keeping an eye on. All cash deals are the safest. The deal is expected to close in the first half of 2017 and still requires shareholder and regulatory approval. Here is the official SEC filing. 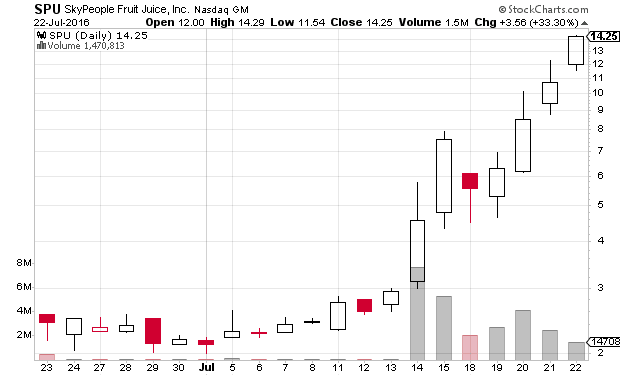 Almost 3 years ago I put out Sky People Fruit Juice SPU as a net current asset stock. In about a week it has shot from $2 to $14 a share. No doubt a major short squeeze is going on and just pure momo. It has now become a great short. Another great short is KONE. Both of these will be significantly lower in a week. OPTT is another candidate when it finally loses momentum. Below are the charts of SPU and KONE. I'm not worried about Europe impacting US growth significantly. That being said I see a very good chance of another down range day on the US indices today Monday the 27th. There could easily be a mini crash. By mini crash I mean at the least enough of a percentage move to trigger circuit breakers. Such a surge in the VIX and a wide ranging day on the major indices like Friday usually produces some follow through. Especially in todays market with all the bots and high frequency trading. If there is any bubble big enough to produce a sustainable crash it would probably have to be in an industry that represents a large share of GDP. The top industry as a share of GDP in 2015 was finance, realestate and insurance at around 20% of GDP. In 2006,2007 this sector was around 30% of GDP before the housing crash. I don't see any real "bubble" in any particular major sector. That's not to say there can't be a recession. There's nothing wrong with a recession. The stock market has been around resistance for awhile now and this could end up being the move that will drive it down for a short term correction at the least. 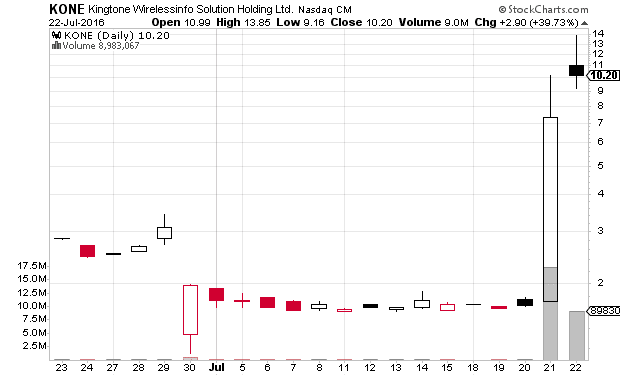 I've been long Smith and Wesson SWHC which has turned out to be a great long for the week or so I've been holding. It was up Friday and is up even more pre-market over $26 from my mid $23 entry. I'm hedged with QID and want to trade any crash today with orders out to long YANG and FAZ. 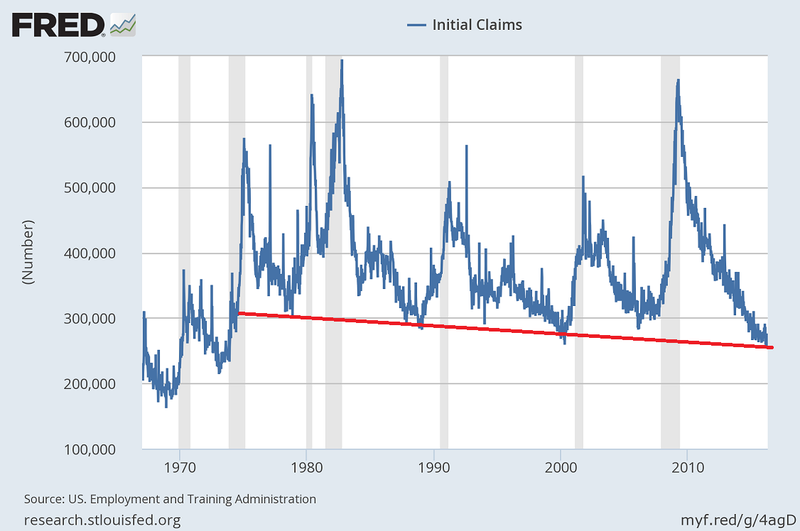 The St. Louis Fed put out a graph of initial claims for unemployment benefits. 253,000 is the lowest number seen since the 1970s. 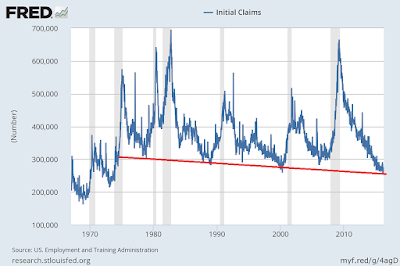 You can see how the major spikes coincide with recessions. It has been such a long time without a major rise that it seems impossible that the current trend can hold much longer. I drew a line that shows the bottom of the trend. The line arguably could be a little higher and flatter. It seems to fit the bottom best here though. Regardless, we are overdue for a spike. This graph shows just how well the economy has been doing. The FED keeps touting 2% inflation targets or whatever magic figure it is. What a joke. We don't need it. Clearly, the only need for such targets is national debt service on our huge national debt. GDP growth last year was modest considering the situation. Some day inflation is going to take off and the FED will be to slow to adapt. That's how it has always been done in history atleast. 37% Gain On Jones Soda JSDA! I posted right after my exit of Jones Soda JSDA on DynamiteStocks.com. So I thought I would post here since I originally mentioned JSDA on this blog. I went long JSDA at $.53 right after my intial post and sold the other day at $.73 for a +37% gainer. While looking through a stock scanner for stocks showing high buy volume spikes I came across a familiar name. Jones Soda (JSDA) has been around a long time and even have their products in my local high end grocery store Harris Teeter. It's been almost forgot now though and trades on the OTC with other penny stocks at just $.51 a share. It bottomed out lately at about $.30 a share. Average daily trading volume on JSDA is 85,000 shares. It traded 1.5 million shares Friday! This is a $21 million company. Looking at the balance sheet everything is fine. No long-term debt and a 1.5 current ratio. Hardly your typical penny stock. Something must be wrong. Yes, revenues have been flat to down the past couple years. Gross margins are stable now though. I think this is one of those companies where expectations are so bleak that anything positive boosts the stock. I see that likely hood a lot more than I see the revenue and earnings getting worse. With the balance sheet the way it is they have plenty of time to get it together. Technically, the stock has bottomed. It looks like a high bull flag going on here. If it breaks over $.56 again it's off to the races. 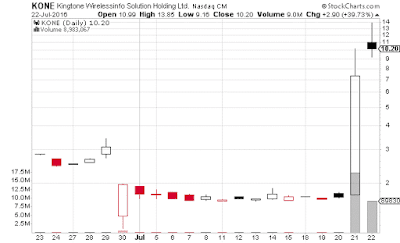 Some of you may have heard about the Valeant Pharma (VRX) news story awhile back. The company was doing some suspicious things and Citron called them out on it. Their report opened up the doors for further investigations. 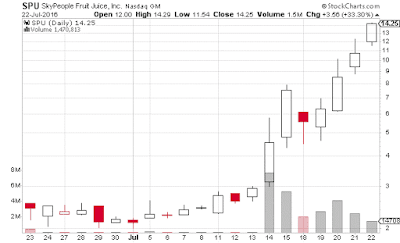 Citron Research does analysis from frauds to simple shorts on overvaluation. There is a short bias tilt. Anyway, be it something fraudulent or just a simple possible short people give Citron attention. That in itself has debatably triggered bear raids on lower volume names. Even larger volume large-cap stocks can see bearish action. Their newest article is on Monster Beverage (MNST). No big smoking gun here. Just simple overvaluation. The stock looks a little expensive. The entire case is in this article here on Monster Beverage (MNST).